We’d love your help. Let us know what’s wrong with this preview of Sekrety osobistej efektywności by Maura Nevel Thomas. Prowadzisz intensywne życie zawodowe? Masz mnóstwo obowiązków poza pracą, zajmujące hobby i kilka ambitnych celów do zrealizowania? Zastanawiasz się, jak to wszystko pogodzić i nie umrzeć z przepracowania? Potrzebujesz skutecznego i nowoczesnego rozwiązania, które pomoże Ci zarządzać czasem i odzyskać władzę nad swoim życiem! Praktyczna wiedza zawarta w tej książce pozwoli Prowadzisz intensywne życie zawodowe? Masz mnóstwo obowiązków poza pracą, zajmujące hobby i kilka ambitnych celów do zrealizowania? Zastanawiasz się, jak to wszystko pogodzić i nie umrzeć z przepracowania? Potrzebujesz skutecznego i nowoczesnego rozwiązania, które pomoże Ci zarządzać czasem i odzyskać władzę nad swoim życiem! Praktyczna wiedza zawarta w tej książce pozwoli Ci zwiększyć wydajność tak, żebyś mógł osiągnąć cele, które dotąd były poza Twoim zasięgiem. 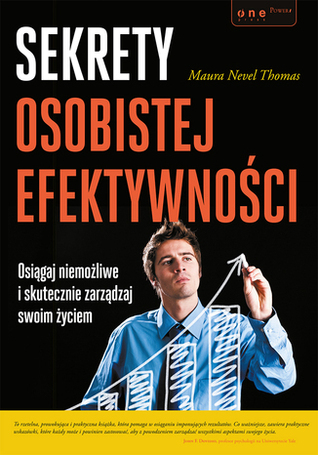 To ask other readers questions about Sekrety osobistej efektywności, please sign up. I moved this book from 5 (amazing read) stars to 3 stars (kind of nice). Motivational speakers and time management gurus are like New Year: they bring their load of inspiration for change, and this inspiration has a short life expectancy. After trying out a revolutionary promising lifestyle for a while, sooner or later our previous habits just take it over again. That may explain why I moved this book from 5 stars to 3. Lifestyle/self help isn't really my thing anymore. - the idea that multitasking is nothing but switching our monotasking processor back and forth between several tasks. Avoid it. Do you remember last time you turned down the radio in your car because you were lost? Our brain is not good at dividing its attention. - the brain dump. Just take a paper and a pen, isolate yourself, and write down *everything* that you have to do. Following the book the next step is then to sort that list on priorities, categories, etc, but I don't go that far. Just dumping my brain on paper is a very calming experience, I usually do it before going to bed. - how creativity most often comes when you are not distracted by your electronic devices. Globally, Maura Thomas has some very practical tips for everyday's life and has some nice analogies to get them through. To give the entire picture I also have to mention that while reading this book I had started using a to do list manager software and configured it as described in the book. That thing didn't work out for me, and the only to do lists I use these days are for groceries or simple stuff. One last thing, I want to mention The Antidote: Happiness for People Who Can't Stand Positive Thinking. If you are fed up with all the motivational talk they sell in your self help shelve, you will love this book. In her book, Maura Thomas invites you to adopt a new methodology with regard to achieving your goals and getting in control of all the things that happen in your life. She goes even further by showing how to implement her methodology on existing softwares. I've read my share of self-help/ organizing/ time management books and this is one of the first that truly changed the way my day-to-day life works. From easy little tips I just hadn't thought of to big, paradigm-shifting ideas that will have a long-term impact, this book is packed with useful, actionable ideas to change your process. A must-read for anyone who's email inbox hasn't been empty in years, or who struggles to organize, index and archive the never-ending flow of paper and digital clu I've read my share of self-help/ organizing/ time management books and this is one of the first that truly changed the way my day-to-day life works. From easy little tips I just hadn't thought of to big, paradigm-shifting ideas that will have a long-term impact, this book is packed with useful, actionable ideas to change your process. Maura Nevel Thomas gives clear ideas for attention management strategies which does not focus so much on how we organize our time but how we learn to control the constant access to data in our lives. The first chapter lays out the idea that today's technology can create an Attention Deficit Disorder or ADD effect on anyone who does not control the flow of data they receive. In chapter 2 Thomas suggests productivity is achieving your goals based on S.M.A.R.T: Specific, Measurable, Attainable, Rea Maura Nevel Thomas gives clear ideas for attention management strategies which does not focus so much on how we organize our time but how we learn to control the constant access to data in our lives. The first chapter lays out the idea that today's technology can create an Attention Deficit Disorder or ADD effect on anyone who does not control the flow of data they receive. In chapter 2 Thomas suggests productivity is achieving your goals based on S.M.A.R.T: Specific, Measurable, Attainable, Realistic, Timely goals. So how does one organize the data? By adopting an organization method either Alphabetically, by Size, by Location, by Time, by Category, or by Tasks for Action. Always have a calendar that is 60% planned and leave the other 40% for the unexpected. Thomas outlines the T.E.S.S.T decision process to help individuals wade through the information they organize. This stands for Take immediate action , Empower yourself and others, Suspend it to your Next Actions, Store it for future reference, and Trash or recycle it. She devotes whole chapters to the praises and pitfall of emails and offers some great suggestions on how you can 'get it down to zero,' a highly sought after goal in productivity which eliminates email as a distraction but maintains its use as a tool only. Chapter 15 finally addresses the work culture and how individuals must adapt to the work culture but try new ways to not let long meetings or a undefined email policy slow them down. First a full disclosure. Maura Thomas, the author of this book, is a good friend of mine. She has trained me on her productivity methods and even asked me for a quote for the opening pages of this book. I'm a bit of an organizational geek and I'm constantly tweaking the way I work in an attempt to be more productive, better organized, and less stressed. Maura's books resonated with me because she avoids the pitfall of recommending the latest and greatest fads in time management. Instead, she focu First a full disclosure. Maura Thomas, the author of this book, is a good friend of mine. She has trained me on her productivity methods and even asked me for a quote for the opening pages of this book. I'm a bit of an organizational geek and I'm constantly tweaking the way I work in an attempt to be more productive, better organized, and less stressed. Maura's books resonated with me because she avoids the pitfall of recommending the latest and greatest fads in time management. Instead, she focuses on the underlying, fundamentals of being productive and happy in this modern, frenetic world. 1. Attention management and why its more important than time management. Maura sets the foundation for her productivity system on a solid foundation of well-documented research. 2. The Empowered Productivity System. This is Maura's process for getting you organized and productive. You'll see aspects of other productivity systems in Maura's approach, namely David Allen's "Getting Things Done" approach. But Maura's system is, in my opinion, more practical to implement and ultimately more effective. 3. Tools. Maura focuses a significant portion of this book on the tools needed to make her system work. Given the ever-changing landscape of software tools available, this is no easy feat. But Maura nets everything down to the essentials. She doen't dictate a singular approach, instead she guides you through the process of selecting a tool set that's best for you. 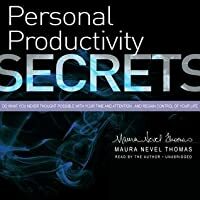 What sets this book apart from other time management books is Maura's understanding that managing your attention and energy is more important that simply managing tasks. Through a thorough understanding of her topic and lots of research, Maura shows why most people who engage in traditional time management programs show poor results and little improvement in their productivity or happiness. One of my favorite parts of this books are Maura's reading recommendations. She is clearly a student of her subject and not afraid to promote the work of other thinkers who have contributed innovative ideas. I have read many of the recommended blog posts and a few of the books that Maura recommends and they have all been excellent. There are a few things in life that I collect. I collect big things like antique tractors, I collect fond memories, and among other things, I collect ideas and tips to become more productive. I wanted a nugget or two, not just to col There are a few things in life that I collect. I collect big things like antique tractors, I collect fond memories, and among other things, I collect ideas and tips to become more productive. If someone asks me to describe this book in only one sentence I would definitely say that this is something like "Getting Things Done: The good parts" for the 21st century. 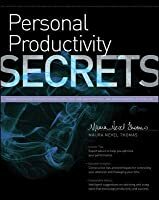 There are many similarities between GTD and "Personal Productivity Secrets" (which is nothing weird, in fact Maura Thomas have worked with David Allen for some period of time), but there is something that makes reading that book way more comfortable. The examples provided in the book are adopted to modern times, e.g. how to u If someone asks me to describe this book in only one sentence I would definitely say that this is something like "Getting Things Done: The good parts" for the 21st century. 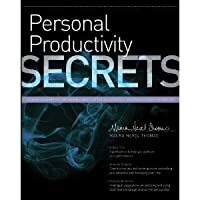 There are many similarities between GTD and "Personal Productivity Secrets" (which is nothing weird, in fact Maura Thomas have worked with David Allen for some period of time), but there is something that makes reading that book way more comfortable. The examples provided in the book are adopted to modern times, e.g. how to use your smartphone, how to manage your e-mail inbox, or how to use modern applications that can help to better organize your work flow. Awesome book. Talks about an implementation using tools availalble on various operating systems today and stratight to the point. Really liked it. A good read but not a golden bullet. Some nuggets of useful advice are included in the widely discussed and in this book, overly repetitive discussion of the issues wit the pace of modern life. - "Multitasking works only when you are involved in separate tasks that do not require much mental effort"
Have some interesting tips but also a lot of of fillers that are useless. It's a good book, and while in parts it seems like most of the method is in essence Gtd, this book was more readable to me than David Allen's original "Getting Things Done". if you have read any GTD books by David Allen then this book is not worth your time...all the same stuff. Audiobook-very good tips on controlling your attention!